Gotta give 'em credit: the developers over at SMART Technologies are an amazing crew. 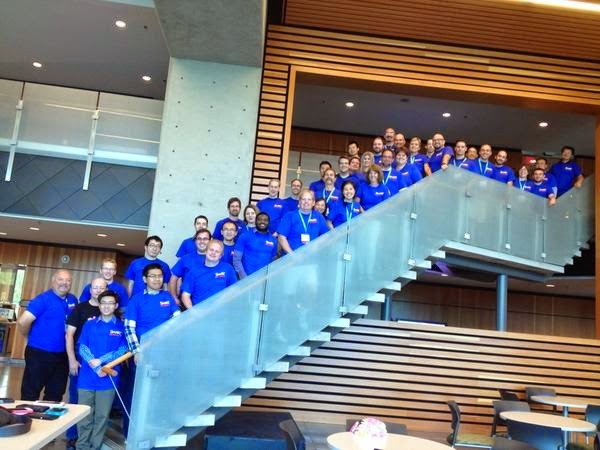 Last week, SMART Technologies hosted the 2014 Global SEE (SMART Exemplary Educators) Summit. 76+ SEEs attended from all over the globe. The week was filled with opportunities for collaboration and innovation. One such activity was the Hackathon where 13 of the 76 SEEs (myself included!) were able to work alongside SMART software development team members to share and realize ideas they had regarding feature requests, modifications and improvements. Within 48 hours, 9 teams of SEEs and their assigned developers realized over 20 ideas. These ideas were then shared with and voted upon by the other 60+ SEEs. Many ideas were met with enthusiastic head nods while others evoked roars of applause. What's truly incredible is that SMART Technologies took the time to listen to teachers about their product. It was amazing to see them take our ideas and run with them, offering suggestions we hadn't even considered. What other software company can say that they not only produce hardware and software solutions designed for teachers but also boasts that they allow teachers to influence the design and functionality of their products? Not very many.